I can't remember a time when I didn't have a doll of some sort in my hand, any size, from teeny tiny to large ones, I loved them. My grandmother had her childhood china doll hanging in a corner of her bedroom and I always had to look at her when we would visit. I got a Hong Kong Lilli doll first and didn't especially like her because I wanted a REAL Barbie.I wish I hadn't broken that doll, but who knew she would become so collectable too? We had friends who had an older girl who had a #1 Barbie. I laugh because she would let me play with her all the time but she wouldn't let me touch some of her other dolls. I doubt they are as valuable today as Barbie. Finally, on my 7th birthday I got a blonde bubblecut Barbie with a case and several outfits. I was so happy. When we would go shopping, my mother would leave me in the Barbie aisle and I would look at each and every outfit they had until she came back for me. 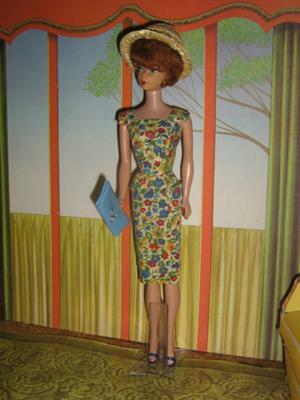 Although I did get quite a few outfits, I was only allowed one doll. My mother did buy me a Ginger Bubblecut at a yard sale about a year later. I wanted a dollhouse but never got the real thing. My sister and her friend made one out of a big cardboard box and made furniture for it too. I loved it and drug it out to the backyard daily and played Barbies there with my best friend. I kept all my dolls and clothing and have continued to collect ever since. Thank goodness, her value has gone up and made her so collectable. My family and friends don't think me so odd now that I still play with dolls.